Well, I am half tempted to drag myself to Taco Bell and see if they'll re-hire me. The old General Manager isn't there anymore, so maybe I'll actually like it there. At the Grand Opening of Shopko I ran into an old work buddy from Taco Bell. We talked a while and she half convinced me to give Taco Bell a shot. "What can it hurt?" She said to me. I left them on decent turns (I only gave them a week notice instead of two), so perhaps the new General Manager will give me a shot. I'm not sure. I'm still keeping my hopes up for the receptionist position at a law firm or a hosting job at Silver Grill. I would really prefer one of those two. However, in this economy I can not be picky. Sorry for the rant above, but I needed to get it off my chest and put my feelings into words. I'll be talking more about it on my other blog; which I've highly neglected. You can click THIS and be transported there. It's just a personal blog I created a while ago. ANYWAYS, shall we get with the teasing? 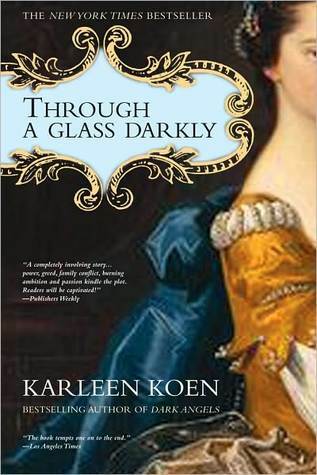 This week I'll be sharing a snipbit from Through a Glass Darkly by Karleen Koen. Roger shook his head, amused rather than irritated by Carlyle's theatrics. Tomorrow, he knew, various rounds of conversion would be repeated in the coffeehouses, and by evening in the drawing rooms. It was inevitable. Roger had been relaxed in his chair. Now he straightened up. Several different emotions chased themselves quickly across his face. Carlyle waited with interest; he loved to watch Roger's face....."
I hope and pray that things will work out for you. The book does sound interesting. Glad you could get that rant off your chest! Thanks Ruth. I pray everyday for strength to get through this tough time. Thank goodness for books, because it is a brief escape from reality. Thanks Eileen! Yeah, I got hired by Subway yesterday but at one 40 minutes away. I'm not sure if they'll give me enough hours, so I'm still looking and hoping they'll give me a call. Thank you for stopping by! B, *sad face* Yeah I hope they give me a shot too!